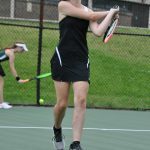 Wednesday the Normandy girls tennis team competed in the OHSAA tennis tournament. The tournament was held in Oberlin. Congrats to the Ladies on a great season. A photo gallery has been posted. The tennis match scheduled at Normandy today has been postponed. The match is rescheduled for Monday, October 1st at Normandy. 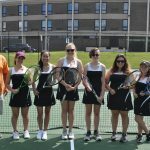 On Monday the Normandy tennis team hosted Elyria Catholic. The Invaders will compete Wednesday in the GLC conference tournament. A photo gallery has been posted from Monday. The Normandy tennis team will be back on the courts today v Parma. 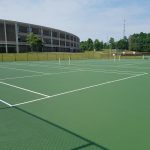 Come out and enjoy the new courts and some tennis with Normandy & Parma. 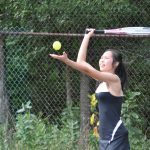 The girls tennis match scheduled for today at Fairview Park has been postponed. There is no make up date scheduled yet. 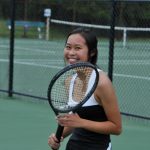 There will be a 1 hour practice today after school for the tennis team. The Normandy girls team was back at home today v Padua. A photo gallery has been posted. The tennis courts at Normandy High School are being resurfaced this summer. They look great and will be ready for the fall season!